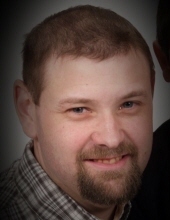 Christopher Carl Breuhan, 42, of Harsens Island (formerly of Lapeer and Warren ), died Sunday, December 2, 2018. Chris was born on January 18, 1976, to parents Chuck and Carol (Mayer) Breuhan at Beaumont Hospital in Royal Oak. He attended elementary school at Martin Luther School, Madison Heights and graduated from Lamphere High School, class of 1995. Chris loved NASCAR racing and recently spent time touring racetracks around the country. His hobbies included building and racing remote-controlled cars, building scale models of cars and boats, especially freighters. While living on the Island, he enjoyed boating, fishing and watching the freighters as they glided by. Chris is survived by his father, Chuck Breuhan of Harsens Island, his son, Shawn Breuhan, of Warren, and sister, Lisa (John) Snyder of East Jordan, two nieces, Natalie and Sarah, and one nephew, Jack. He leaves behind many beloved aunts, uncles, and cousins. Chris is also survived by special family Bailey and Brayden. Chris was preceded in death by his mother, Carol Breuhan in 2015. In lieu of flowers, memorial contributions may be made to the family. Christopher’s memorial service will be held 11:00AM Friday, December 7, 2018 at Muir Brother Funeral home, Lapeer. Chris’ family will receive friends from 10-11AM at the funeral home the morning of the service. Condolences may be left at www.Muir BrothersLapeer.com. "Email Address" would like to share the life celebration of Christopher Carl Breuhan. Click on the "link" to go to share a favorite memory or leave a condolence message for the family.